The Play Outside map from Delaware State Parks will help you find the right park, preserve, trail or playground so you can head out and play outside. Play Outside offers a convenient and detailed map with information about public parks and recreational facilities in Delaware. Find nearby public outdoor recreation areas such as municipal, county and state parks. Find wildlife areas. Find playgrounds, ball fields, fishing piers, trails, and more. And find the things like parking lots and bathrooms that you’ll need as well. Play Outside is an online mapping tool designed to be useful on any size screen. Plan your adventures on a desktop. Share your plans with the kids on a tablet. Carry your map and information with you on your smartphone on your adventures. The application can show you where you are in a park or on a trail, using your smartphone’s location information. So you can adjust your plans as you go. Play Outside was developed by the Division of Parks & Recreation in partnership with the Department of Technology and Information. It uses Geographic Information System (GIS) software to present information from the Delaware Outdoor Recreation Inventory combined with data such as road information from DelDOT. The information can be viewed over a standard road map or over the latest Delaware aerial photography. 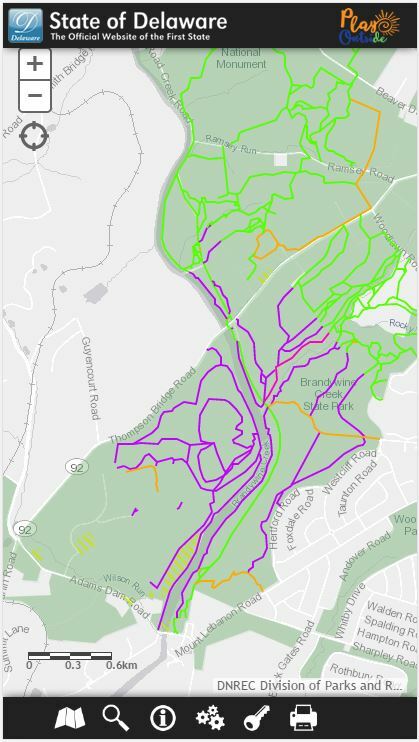 Users can browse the map to find information, or use a search function to find the nearest outdoor recreation opportunity. The data in the system is updated on an ongoing basis by state agencies and others. Much of the data is also available through the Delaware FirstMap geospatial data website. The information provided by the Play Outside website is for graphical representation only. Data is reviewed and updated periodically. However the DNREC, Division of Parks & Recreation provides no guarantee, expressed or implied, as to the accuracy and/or completeness of the information herein. The State of Delaware and any of its employees can not be held accountable for any and all claims arising from any and all claims for loss, damage or injury to persons or property of whatever kind or nature arising from the operation or use of this data. Contact the managing agency for park rules and other information.